You’ve probably been busy for the last few weekends, scooping up the last of the January sales bargains before they go, but do you ever stop to look up at the old buildings around you? Even the busiest shopping streets hold lots of clues to the rich history of the buildings in Reading and you can take in some of the local history of the city as you shop. The window display alone at Jackson’s Corner in the Kings Road, which houses the family-run department store, looks like a trip back in time. Opposite, Jacobs the Jeweller moved back to Douglas Jacobs House in King Street in 2005, where the business was originally started back in 1948 before it was moved. Around the corner, The George Hotel, dated 1506, is at least 500 years old this year, but may be up over 700 years old. Roundheads and the Cavaliers used to meet up for a fight in the cobbled courtyard. Other buildings worth a glance up at as you walk past include the Oxfam bookshop and Lloyds Bank Chambers next door in the High Street, which is still a branch of the bank. At the end of the High Street in the Butter Market is St. Laurence's Church, which was originally erected with Abbey Church to serve the people of the east of Reading. It was rebuilt in 1196 and again in the fifteenth century. As the Abbey brought trade to the town, the area outside got its name as it became a market place with stocks and a pillory. The Grade II listed Victorian Town Hall and Reading Museum complex opened from 1872-5. The three buildings on Blagrave Street were designed by local architect, Alfred Waterhouse, in a high gothic style. The 1950s-style Bristol and West arcade which comes out opposite and runs onto Friar Street might not have much to contribute in terms of architecture or historical interest, but the little caff there is a great place for cheap all-day breakfasts and big steaming mugs of tea to fuel those exhausting shopping trips. The Edwardian Harris Arcade is still pretty intact and houses some interesting treasures behind its curved wooden shopfronts. Around the corner, in Station Road, the building above Fifteen is worth a second glance. At the end of the road, the Three Guineas pub is in what is left of the old Reading Station building originally built in 1840 and rebuilt in 1865. Isambard Kingdom Brunel designed an unusual station plan for Reading as the town at the time was only to the south of the station and he wanted trains to both London and to Bristol to stop on the same side, meaning that London bound trains had to cross the path of Bristol ones, which almost ended in disaster when a signal man made a mistake and switched a fast running express into the platform line. As Queen Victoria Street opposite was not built until 1901, a deep dip used to sit between the railway embankment and the rest of the town. This is today is lined with Victorian red brick buildings, including the ornate Lawleys China and Glassware display windows. At the bottom in Broad Street, check out the buildings above Jaeger and Clinton Cards, Country Casuals on the corner of Chain Street and even Famous Memorabilia. Waterstones bookshop in particular is worth a look as the building is housed in the Broad Street United Reform Chapel. The chapel has been on this site since 1707 and the entrance shows that it was last rebuilt in 1892. Inside the bookshop, you can see showcases of artefacts such as coffin plates and memorial stones salvaged from the chapel. Around the corner in West Street is one of my personal favourite stores of all in Reading, the beautifully maintained McVicars butchers at No 20, which was built in 1886 and looks exactly as you would have imagined it over a hundred years ago. More beautiful buildings line the streets down to St Mary’s Butts, where the graveyard to the 11th Century church is a common short-cut for many shoppers. Opposite the church, there’s a fountain that was erected to celebrate Queen Victoria’s Golden Jubilee in 1887. 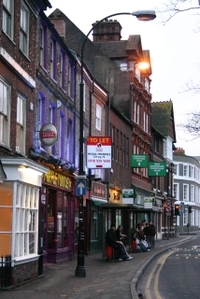 At the end, the buildings on Gun Street now host galleries and bars rather than gunsmiths. Behind the church, the first department stores came in 1854 with John Heelas’s drapers in Minster Street, which soon expanded from cloth to carpets and furniture and later in 1929 Broad Street. In the 1980’s the shop was rebuilt on the present John Lewis site. Others followed suit; Marks and Spencers opened an open-fronted penny bazaar in West Street in 1904, opening a second shop in Broad Street in 1912 and closing West Street in 1936. Wellsteeds on Broad Street eventually became Debenhams, now part of the Oracle. The Oracle shopping centre now dominates the town. It was built in 1999 on the site of the Simonds Brewery, the Heelas depository and the old bus depot. The previous Oracle in Reading had been a workhouse built to provide employment in the cloth trade in 1728, funded by John Kendrick in his will. It was later used as troop barracks during the Civil War, before it was demolished in the nineteenth century. The back of the shopping centre today houses the cast stone for the old Reading Corporation Tramways Power Station. In 1940, after the Second World War had broke out, the old stone was boarded over at the tram station and changes made to the destination names so that as little geographical information was given out as possible should an enemy invasion occur. A massive mural on the side of the Central Reading Youth Provision in London Street faces the shopping centre. The mural was unveiled on 16th June 1990 to the memory of C.L.R. James and the peaceful anti-apartheid demonstrators massacred in Soweto by the South African Regime during the uprising which began on the same day in 1976.